Does your child have a special toy they take everywhere? A toy they eat with, sleep with, play with and would take in the bath if they could? Mine does. My daughter’s special toy is called Pig. In Guff, the little girl’s toy is called Guff. And Guff goes everywhere. 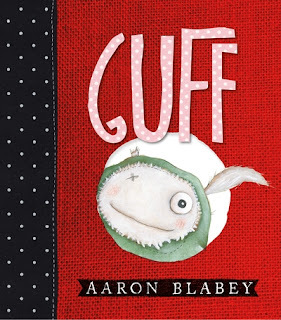 Aaron Blabey has captured the essence of a child’s relationship with a special toy in this beautiful and funny picture book. The story is simple—short sentences, short words—but its simplicity is what makes it magical. The book is written from the girl’s point of view, and she really comes to life through the story, saying the exact things a child would say about their favourite toy, treating quirky-looking Guff exactly how a child would treat their special friend. Guff joins the family on the bus, he does the school drop off with Mum, he gets lost, gets found, gets stinky and gets clean. And through it all, he is always, always loved. This is one of those special books that will appeal to parents and children equally, but in different ways. As a parent, if you’ve ever had to search a supermarket for a left behind 'friend' or had to rescue said friend from a swimming pool, you are going to relate to, and love, this story. The mother’s emotions and expressions are just glorious: utter terror when Guff gets left behind, frustration when Guff is lost (and the world has ended) and love when she sees how special Guff is to her daughter. And for kids, Guff provides a funny and very relatable story. For those with a special toy of their own, it provides reassurance that having a best friend made of fabric is perfectly fine. And for kids who don’t have such a toy, it might introduce them to the possibility of befriending one. The illustrations are true to Blabey’s fun and funky style, and the sneak peek they provide into a life with a child’s constant companion is hilarious and spot on. If you have an extra member in your family, you and your kids will love this book. And if you don’t, you will still love this book because once again Aaron Blabey has delivered a fun and hilarious story for everyone to enjoy!